Over the years, as my job has become more complex, my memory has — distressingly — become weaker. Meaning that remembering everything I have to do has become quite a chore. 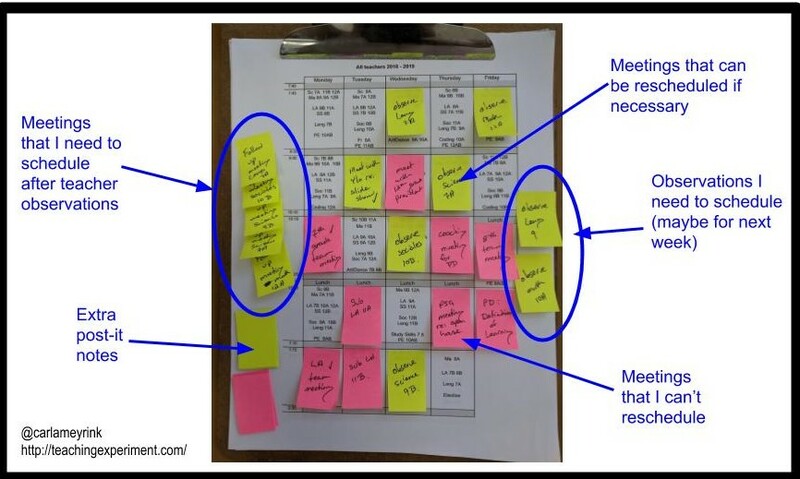 In the past decade, I tried using paper agendas, online agendas, digital reminders, paper sticky notes, digital sticky notes, lists — none of them has worked 100% for me. A couple of years ago, though, after some trial and error, I came up with a solution that fit the bill perfectly. I’ve always tended to do better with paper: I like leaving reminders open on my desk to greet me in the morning, so that I don’t forget what I have to do. Digital agendas are fine, except that I often don’t remember to open them. Plus, I really love the feeling of picking up a pen and crossing things off my to-do list. However, I always found that book-like agendas had a very limiting trait: if I didn’t do something I’d jotted down on my list for that day, then I’d have to painstakingly recopy it into the next day’s page… or turn the page and forget about it altogether. The latter happened dangerously often. So, I came up with a solution that I’ve been using for the past few years and that some of my peers have started to use as well. It’s an old-dashioned clipboard and paper solution, but it has the advantage of being flexible. And when you’re working in a school, where your plans can change instantly so many times a day, flexibility is key. 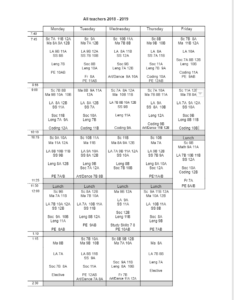 I print out a schedule that includes all the classes being taught in each hour. 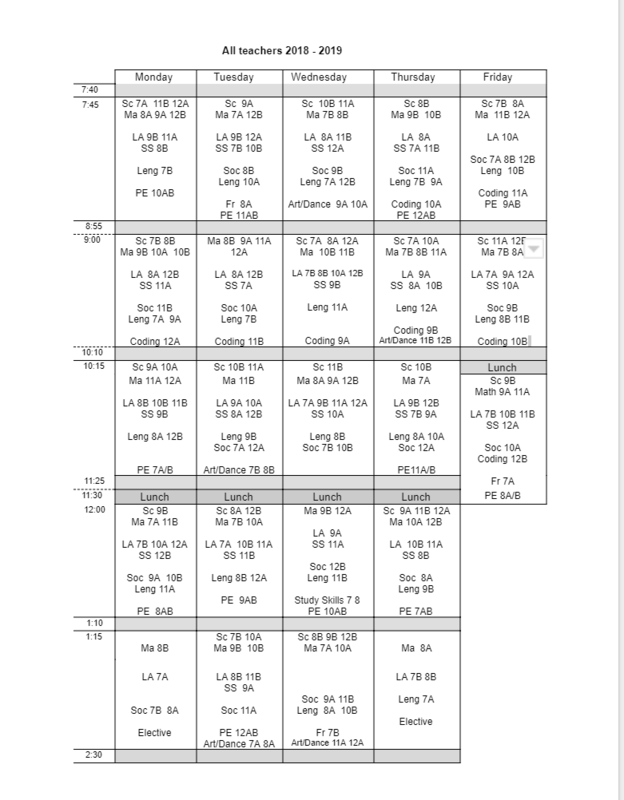 That way, if I want to observe certain teachers, I have their schedules available at my fingertips. I cut small sticky notes in half so that they fit perfectly in my schedule boxes. I use two colours: pink for priority items that can’t be moved, such as parent meetings or student presentations, and yellow for more flexible appointments, like classroom walk-throughs. I start by scheduling any priority meetings I have pending (in pink notes). Around the edge of my schedule, I place yellow sticky notes with all the meetings and observations I’d like to accomplish during the week. Then I do my best to place them in my schedule. If I can’t schedule them, I leave them around the edge, in case a space opens up. If an important meeting comes up during the week, I may have to move a yellow note to make room for it — so it goes back to living on the edge of the schedule. The beauty of using sticky notes is that when I can’t get to something, I can easily reschedule the meeting somewhere else. For instance, if I plan to observe a chemistry class at 9:00am on Tuesday, but an emergency comes up, I can just pick up the sticky note and re-assign it to the next free chemistry class. Any of my plans that I don’t manage to get to, I move to the next week’s page and begin again. I usually have about four weeks of schedules on my clipboard so that if a meeting is scheduled for a date in two weeks, I can plug in my pink sticky note and make sure I remember. At the end of the week, I copy all of the meetings I had over into an agenda, so that I can look back on them if I need to. Then I remove the sticky notes and I can reuse the schedule. It’s a simple tool that really works! Brilliant! I love when we come up with systems that really work well for us! I use a Google Doc as a to-do list, coupled with a draft email in my inbox. Yes, I know about Google Keep. Yes, I know about Tasks. But somehow, this just works better for me. I love how yours gives the opportunity to prioritize, though! I may try something similar to build drafts as I head into scheduling season :-). Thanks for sharing! The sticky note agenda always worked well for my brian Carla. I love how mobile the notes are. Moving them around encouraged a level of proactivity and productivity for me. I aslo advocate for this type of jornaling. I am so grateful you shared this idea with me, it’s brilliant! It makes my life easier. Like you I have online and paper agenda but nothing like this. You are genius. Something so simple and yet so effective. Thanks Carla!!! Let me know if it works for you Michelle!